Our food grade wood pellets guarantee a consistent source of clean raw wood and a quality wood pellet manufacturing process. Royall guarantees that you’re getting a high quality food grade wood pellet every time. We regularly test our wood pellets for ash content, moisture level, and heating value to assure you’re always satisfied with your wood pellets. 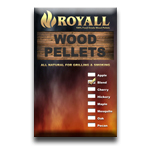 Wood pellets that provide a clean, consistent burn with high heating value and less cleaning.